How To Get A Good WordPress Developer ? There are a variety of reasons of the increasing demand of WordPress developer in recent years. The increased numbers of the WordPress themes and plugins require more develop to involve in order to create, fix and maintain the existing themes and plugins. However, individual bloggers can’t afford to hire an in-house WordPress Developer. Therefore they can only hire a freelance or temporary developer by task or project. According to my experience, 70% of the first time hiring leads to fail. You would probably end up with your money wasted and the task remain pending. In this article, we are going to share with you how you can get a good WordPress developer for completing a task or project. Where can I find WordPress Developers ? We were so excited to find some really cheap developers from India, Bangladesh, Pakistan and Philippine. However none of them end up with a complete development cycle. Their profiles and examples of work are looking good, but for some reason they don’t have enough skill to complete the task in the way you want it to be done. Anyway, I am lucky enough to find the good one among them and most of them are from Philippine. We realized that the main reason to lead the project to fail is the communication. Before we offer a job to a developer, it’s good to give them some simple test / probation period to see if they are capable enough to take the job. Sometime they will said that they understood the project requirements and goals, in fact they don’t. By asking some simple questions related to the requirements you will find some clues. The developer reputation gives you a fast insights about their freelancing experience. It would be risky to hire those who have negative review or zero project done. However, some fresh developer do have good skill and chances shall be given. We somehow met some Well-Spoken developers with excellent profiles and experiences. We suspect that a different developer was working with the project after approval. It’s way obvious that the quality of work was from a beginner rather than a senior. We’ve terminate the job and file a report to the incident. We’ve learned to filter the developers by giving them some sort of test. If you are going to take the developer for a bigger project, create a short assessment project in order to get the best among the developers. Most of the developer do not entertain the assessment work for free. 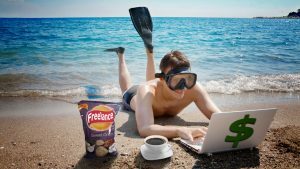 It’s challenging and also risky to get the job done through he freelancing platform. The first possible problems would be the maintenance after the work. Some code might breaks after the WordPress or PHP updates. We are not recommending you to outsource your work here if you got a big project or a heavy development. However, this is the best place to get your small-medium job done at a very low cost. You should always review the code and make sure they are not hard coded in a way. Home » Geeky Duck Learned » How To Get A Good WordPress Developer ?